C.A.P.S. 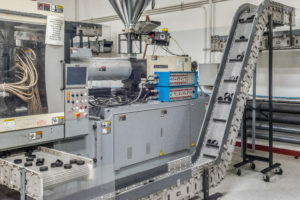 Inc., a producer of about one billion caps and components annually for food, personal care, household products, medical, pharmaceutical and other applications, had issue with their fixed-length metal conveyors. The fixed-length conveyors slowed production because they were immobile, had maintenance difficulties and a continual need for replacement. C.A.P.S. Inc. began purchasing DynaCon modular conveyor systems in the mid-90’s and the conveyor system has expanded right along with their business. “Our modular conveyor system grows right along with our business because it works on every product we make. It is very easy to add and remove sections and accessories as needed, such as extended sides and cooling fans. If we decide to run two machines into one conveyor system, I can extend the length of the conveyor easily. Everything is easy. Whatever the situation calls for, there is usually a very easy way to do it,” explains Brett Huster, Engineering Manager. In addition to getting a system that has grown with their company, C.A.P.S. Inc. has lowered downtime and increased safety while also making gains in quality and customer satisfaction. The resulting efficiency and dependable performance has contributed significantly to the reduction of the ratio of scheduled maintenance work hours compared to emergency maintenance work hours, which have been reduced from 1:1 to 15:1.